Owning a home is quite a bit different than renting a place where if something goes wrong a quick call to the property manager results in maintenance coming by and fixing a problem. Yes as a homeowner you can call a plumber to fix a toilet that won’t flush or can call a handyman (or woman) to come fix a squeaky door but eventually all of those calls will quickly add up in costs. Those dollars spent on calling someone to fix a problem could be put to better use by the homeowner spending on other things they need or by simply adding it to a rainy day fund so when something major does go wrong and a professional contractor can be called in to make repairs. This article explores some of the essential skills homeowners should have in order to make sure their home is running in tip top condition. Whether you have a slow drain or your toilet clogs up knowing which type of drain cleaner to use or having handy a toilet plunger or toilet auger (sometimes referred to as a drain snake) can save you hundreds if not thousands over the life of owning that home. Routine calls to a plumber will run a minimum of $80 dollars and up depending on your location. Drain cleaning solutions run no more than 10-20 dollars a bottle and often provide multiple uses with one bottle. A toilet plunger should run no more than 5-10 dollars and a toilet auger should cost no more than 20-30 dollars and get multiple if not unlimited uses based on the quality of the product. With a slow drain a gel based drain cleaner can help get into drain and remove the clog that is causing the water to flow slowly. It the drain is completely stopped up then it is best to wait and see if the water will slowly drain out (it may take hours) or use a plunger to attempt to force the clog through the pipes and then treat with drain cleaner if the water is still running slower than normal. Once standing water has been removed and the water flows better down the drain it still may require a few treatments to ensure everything flows smoothly in the future as generally a onetime only cleaning may open the drain up partially but there is still material within the drain that can cause it to clog up again. Those who are comfortable opening up the drain trap (sometimes call P or S traps) can do so and clear out any clogs in the trap without the use of any chemicals. Before disassembling the drain lines make sure all the water is gone from the clogged sink and keep a bucket or large pan underneath the drain line to catch any water that does remain. After cleaning the drain trap it should be re-assembled in the same order it was dis-assembled. Some of the washers/gaskets for the trap may need to be replaced with new ones in order to prevent leaks from happening below the sink. If a toilet clogs up it is best to not try multiple flushes to clear the clog as sometimes the toilet will overflow with the water and other “stuff” resulting in a big mess on the floor. Sometimes letting the water sit can cause the blockage in the pipe to soften which a subsequent flush can clear. Again be careful as if the water level in the toilet bowl is close to the top, another flush can quickly cause a bigger mess. A plunger or toilet auger will be the best bet for clearing a plugged toilet. Often times when a plunger cannot get the job done a toilet auger will be able to as it is able to get deep into the pipes and push a clog through. The electricity that feeds your house generally comes in from an electrical line from outside that is fed through an electrical box. Most modern electrical boxes have circuit breakers in them although there may be some older homes with electrical boxes that still use fuses. The circuit breakers or fuses are designed to protect your home and the electronics in the home from power surges. If power surges through an electrical circuit the circuit breaker will automatically switch off or if a fuse the fuse will burn out. Burned out fuses will require replacement with a like kind fuse. Don’t try and put in a fuse that is larger than the one required for the circuit as that could lead to damaged electronics or even worse house fires. For homeowners with a circuit breaker, knowing where your circuit breaker is located and how it works can save you money since you can reset a circuit on your own without the need of an electrician. If the power surge was external, whether through lightning strike or cause by the power company, resetting the circuit breaker should restore power to the affected area. If the circuit breaker tripped due to something in the house such as putting too many appliances on the same outlet or same circuit then before resetting the circuit breaker you should make sure that the appliances are changed to different outlets. On the other hand if a particular appliance has gone bad which caused the circuit breaker to trip then that appliance should be removed and serviced or replaced as need be. If everything is the same in your home and no new appliances have been added, you weren’t running the microwave, electric oven and refrigerator at the same time then and electrician may need to be called to make sure nothing is wrong with the wiring and/or outlets in your home. Anytime switches or outlets spark and/or catch fire it is better to call in a professional to have the problem dealt to make sure there is not some hidden issue that could cause a bigger problem later. Squeaky doors, stuck windows, nail pops on the deck, all can be easy fixes with the right tools and know how. Simple things like doors that squeak or maybe even stick can be taken care of with the right type of lubricant. Even an extremely noisy garage door opener can become less noisy with the right lubricant in the right locations assuming no other major mechanical issues. Review owner’s manuals for items like the garage door opener, dishwasher, the furnace and more. Things like changing an air filter in the furnace every month can mean a furnace that lasts for 15-20 years as opposed to 7-10 years. Keeping the dishwasher filter clean can mean saving money through a properly performing appliance. Not everyone needs to have a green thumb to do things like mow the lawn, trim hedges, and put down mulch in flower beds. Even if you have a black thumb mowing the lawn and making sure hardy plants and bushes are kept properly trimmed is a great skill to have. Not only can you keep up on the curb appeal of your home you can also save the money you would spend to hire a professional to do all that work for you. Depending on your yard size once a week lawn mowing service can add up fast and then add to that the need for periodic landscape cleaning whether due to leaves or in order to clean out plants that may have died over winter, having the right tools (shovel, rake, work gloves etc.) means a homeowner can take care of the landscape in very little time and get to enjoy the outside of their home. Whether something needs a nail put in or a screw, knowing how to do drive a nail or screw into a wall can save you over time. Being able to find the stud in order to properly secure a heavy picture on the wall can mean the difference between a picture that stays up on the wall as long as you own the home or a broken picture and possibly broken drywall both of which will cost money to fix. 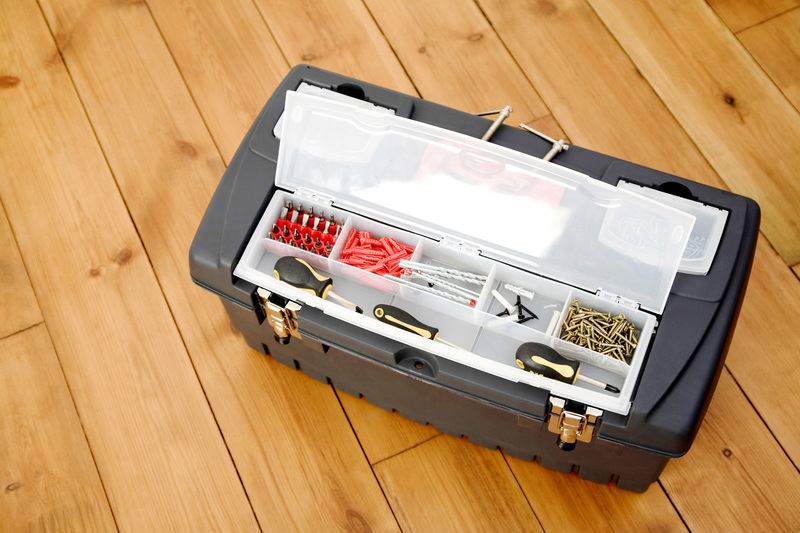 Knowing which screws to adjust can also mean fixing loose cabinets on your own versus hiring a professional to take care of those things. Basic carpentry skills include measuring, using a level (you want that picture to be mounted so it looks straight to everyone who sees it), and some cutting. All of those skills can be pretty helpful when owning a house as often times it is quicker and cheaper to do something yourself that call and wait for a professional to stop by and deal with the problem. Owning a home is a dream for many but if the home is left without the needed maintenance the home can quickly become something that the owners do not enjoy. By learning how to perform certain home maintenance tasks on their own homeowners can save money and ensure a home to works the way it should all the time. 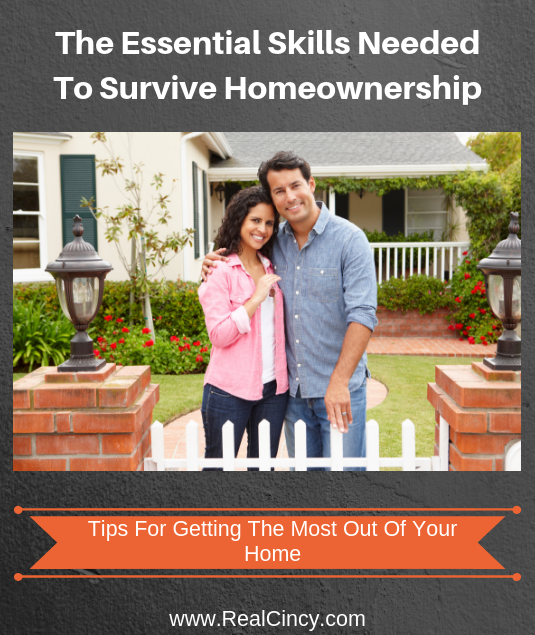 About the author: The above article “The Essential Skills Needed To Survive Homeownership” was provided by Luxury Real Estate Specialist Paul Sian. Paul can be reached at paul@CinciNKYRealEstate.com or by phone at 513-560-8002. If you’re thinking of selling or buying your investment or commercial business property I would love to share my marketing knowledge and expertise to help you. Contact me today!